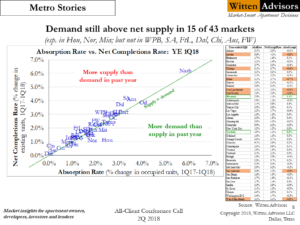 Excerpt from the 2Q18 Witten Advisory: This supply/demand scatterplot shows most markets clustered near the green dashed line where demand growth (on the horizontal axis) matches supply growth (on the vertical). With new deliveries having ramped up in most markets, we’re now at the stage of the cycle where completions are running slightly ahead of demand, which means that occupancy rates are edging gradually lower in most markets rather than climbing. However, market-wide absorption did surpass net supply in about a third of our markets, 15 to be exact, with Houston, Norfolk/Virginia Beach and Miami/Dade County the biggest winners. 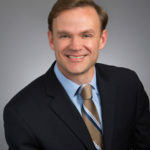 On the other end of the spectrum, the headline notes that two South Florida markets plus four in Texas and Chicago saw demand fall well short of supply, losing at least a half-point in occupancy year-year.